In August, at the Atco Dragway Lucas Oil Drag Racing Series event, Cleve Bryant of CBS 3 Philadelphia News came to spend the day of qualifying with Karen, Tom, Paul and Emily. He and his photographer followed the team on in the pits and on the track, and Cleve even sat in Karen's car to warm it up! See the video below for the details! The Family was also featured in a story on the Press of Atlantic City's Television Magazine show called 30. Dave Weinburg of The Press also spent the day with us and created a video that was aired on the Stockton University station and on the Press of Atlantic City Website. Click on the links below to see the stories and the video! If the link doesn't work automatically, copy and paste the link to your browser! It’s been a while since I have updated, but we have had many things going on in our personal life that have caused a lot of distraction from racing. Personal tragedies, illnesses, loss of loved ones—you name it. I could write a book about the past 12 months, but you wouldn’t believe it. It would only be able to be sold as fiction. High on the list of events was the loss of someone very close to us. The man who 20 years ago gave me a chance to drive a Top Alcohol Dragster, Tom Jones, died of cancer in February. It hit us all very hard. I owe so much to Tom. He was more like family to me than some of my own family, and it has been hard not to see him at the race track doing what he loved. We had a lot of good times together, and I am proud to have driven for him. He gave me an opportunity that led to meeting my husband and having this wonderful family. I will forever be grateful. I could go on with so many more stories, but I will just say that sometimes things happen in your life that make you realize that your family’s health, love and well-being are much more important that hobbies and business. Thankfully, everyone is ok and we can turn our focus back to racing! I got a late start this season because my main welder/crewchief/fix-it guy, my dad, had major back surgery right before the Virginia Regional event. We did not attend the Charlotte National event either. Dad is now feeling better, and we have attended Maple Grove and Lebanon Valley Regionals, and the Norwalk Summit Nationals. We have been struggling with a tuneup over the past couple of years, and over the winter had our fuel pump re-conditioned. We had to replace the gears inside, and now we feel like we are starting a new learning curve. In Lebanon Valley this weekend, the weather was terrible. Rain, severe humidity, high density altitude, and a tricky race track were very challenging, and we failed to qualify for the 8 car field by 0.06 seconds. We were feeling very defeated, so we talked to some of our fellow racers about our engine combination and received a lot of helpful advice. We are currently making some changes that we are confident will help improve our program. In order to make these changes, we will be skipping the New England Regional Race in Epping, NH to focus on getting the car ready for some local testing and hope to have a strong outing at Atco Dragway and Cecil County Dragway to finish out the Regional schedule. 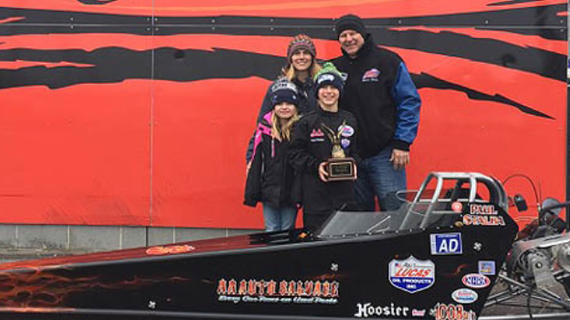 On a better note, my son, Paul, has 2 wins and 2 runner-ups at our home track, Atco Dragway, and is currently leading the points for the Pro Jr Dragster championship at Atco. He is driving very well and having a lot of fun. Paul and I went to see Cars 3, and it reminded me of us—mom, who’s no longer the rookie, mentoring my young driver along with my husband. I cried most of the movie! My husband, Tom, has also had a pretty good start to the season. He is in the Super Gas final from the rain delayed Maple Grove event, which will be run at Atco. He had a semi-final finish in Super Gas at Englishtown’s Summernationals and a quarter-final finish in Super Gas at the New England Nationals. 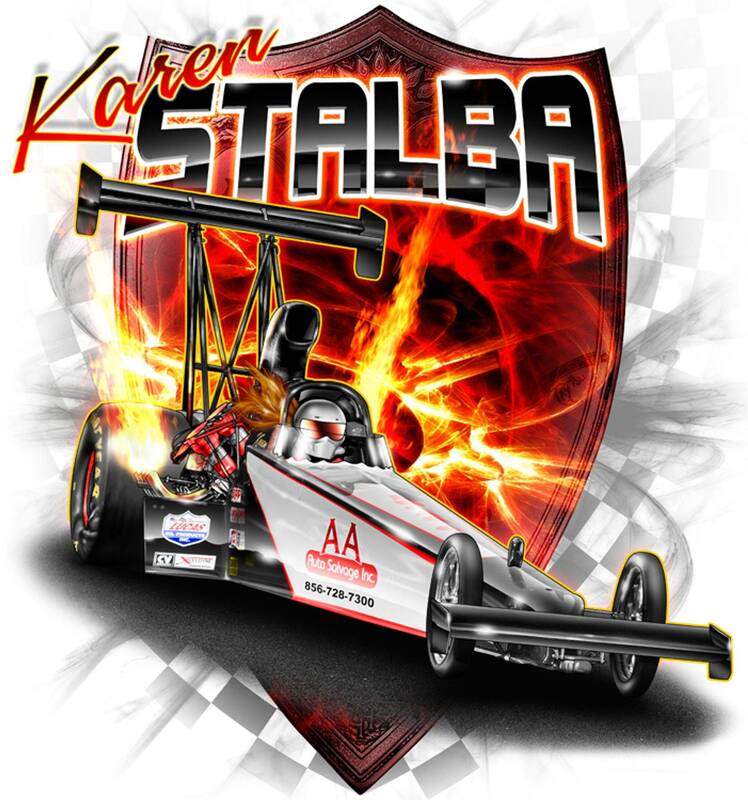 I would like to thank Lucas Oil Products, NGK, Mahle Aftermarket, Clevite and A.A. Auto Salvage, Inc for the continued support and look forward to representing you much better this season. 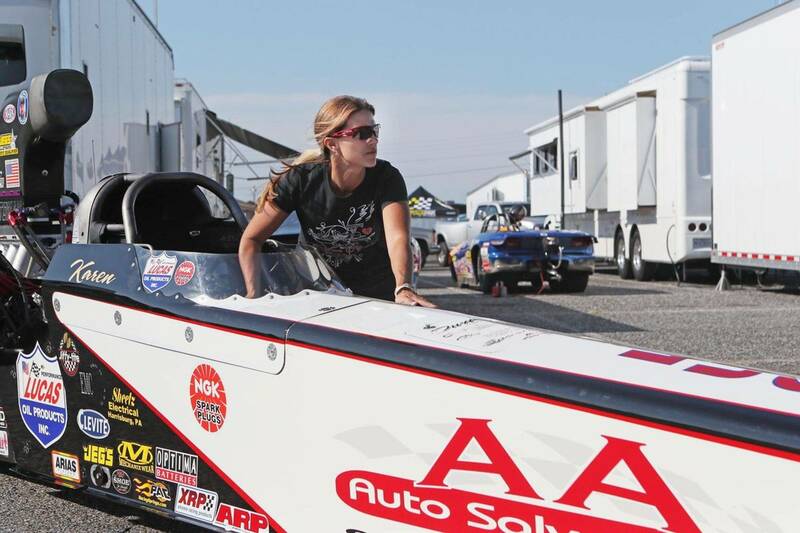 Karen sits down with Bill McKnight of Mahle Aftermarket at Norwalk Nationals.